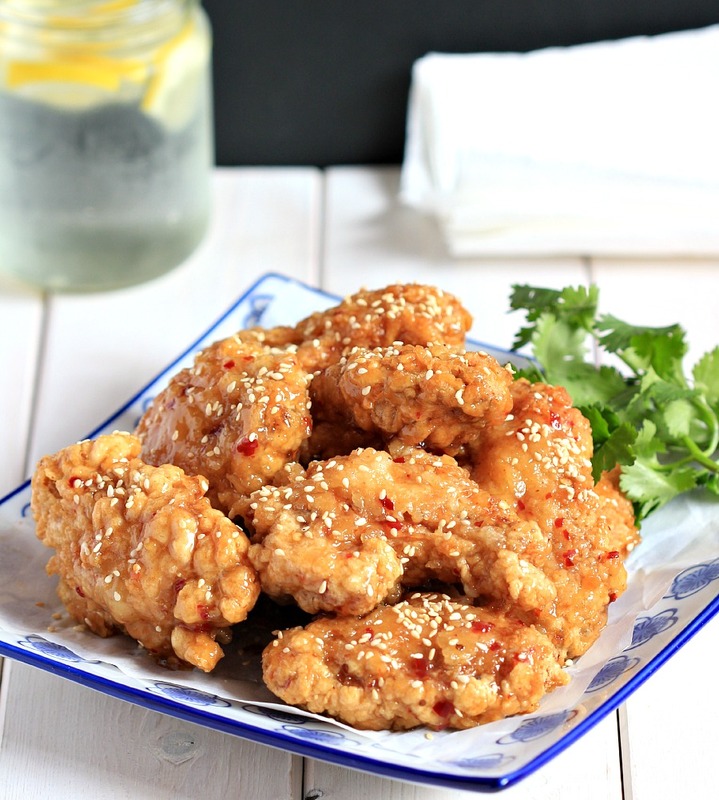 my bare cupboard: Extra crispy Thai-style sweet and spicy chicken wings "
I'm not exaggerating about the post title , that's really the name of these uber crispy wings . When you think about it , in this finger lickin' dish beside having the protein , the chicken , there's also carbohydrates , the flour and tapioca combo ( breading ) so , all you need is some steamed or stir fried vegetables to have complete well-balanced meal , sounds good , right ?! Heh ! One of the things that I would change in this recipe is to marinate it overnight and maybe add smashed lemongrass for more flavor . I marinated these wings for about 45 minutes and that wasn't enough to give much flavor on the inside . The original recipe doesn't call for marinating the wings but I like my wings not only tasty on the outside but also the inside . I used tapioca starch in making the sweet and spicy sauce but I think using 1 1/2 tablespoon of it is too much . The sauce turns very thick as it cools down and I had to add another 2 tablespoon of water to thin it out . I guess you won't have any problem if using cornstarch . * In a large mixing bowl , combine chicken wings with 2 cloves of garlic , minced , 1 1/2 teaspoon grated ginger , 1/2 teaspoon freshly ground black pepper and salt , to taste . Marinate for at least an hour or overnight . * Place vinegar , sugar , water , fish sauce , wine , garlic , ginger juice and chili flakes in a small saucepan and let boil over medium-high heat . Reduce heat to medium and let boil until mixture is reduced by half , 6-8 minutes , stirring occasionally . Whisk the tapioca mixture and cook for another 2 minutes until sauce thickens , remove from heat and set aside . * In a shallow bowl , mix together flour , starch and baking powder . Beat eggs in another shallow bowl . Pat dry wings with paper towel . Working in batches few wings at a time , dip / dredge wings into the flour mixture , coat into beaten egg , dip again in the flour mixture . Continue until wings are coated . * Preheat over to 200°F . Fill pan with 1-inch of oil , when oil is hot , place chicken wings into the oil and fry over medium-high heat until golden brown on the first side , flip over and continue to fry the other side , 5-7 minutes per side . When cooked , place wings into the plate lined with paper towel to remove some excess oil then transfer to a baking sheet and into the oven to keep them warm . Continue with the remaining wings . * Place all wings in a mixing bowl then pour in the sauce and toss until wings are well coated . Serve immediately . Hello Anne! Thanks for staying connected all this while! I'm sure you are not exaggerating! Lovely recipe lovely shots! Ah, so that's the secret to crispy finger lickin' good wings!!! I must try this ASAP! Sweet and Spicy are my very best flavors for crispy wings. I think you're right about marinating them over night. It certainly can't hurt!!! I would finish all of them at one go, Anne. They look really great and that sauce sounds totally delectable too. 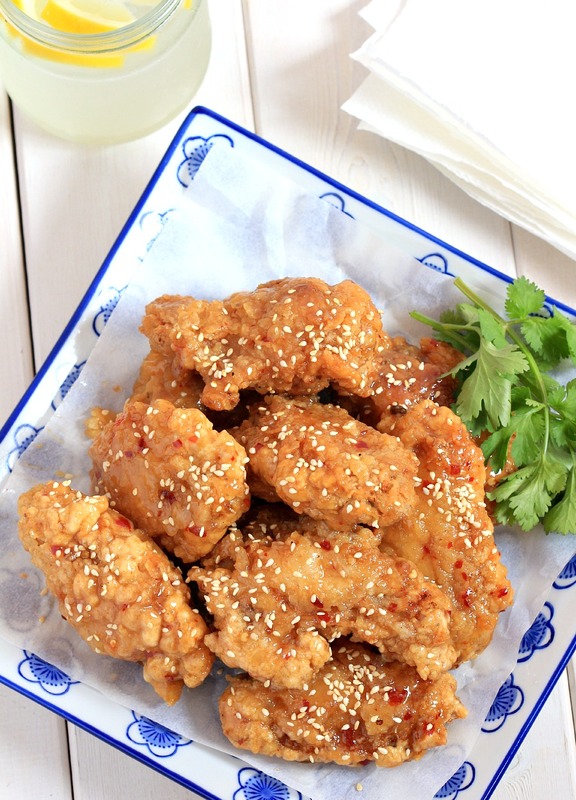 The crispy chicken with the sauce are very yummy combination. Great to cook this dish for Chinese New Year to eat with rice or drink with beer. I love chicken wings! Pass that plate over! I could finish every single piece! Yum! Hi Anne, this is fabulous. I'm drooling over it. they definietly look very good! I absolutely LOVE crispy chicken! This looks so good! I love <3 this recipe, Anne!. I have all the ingredients and I am dying to try this some friday evening.